He was already a star at the dawn of the new decade – Ziggy Stardust, Major Tom and much more. Yet, as the 1980s unfolded, David Bowie would add to his work, his life, and his legacy with a string of successful albums. He branched out into acting, and launched one of the most elaborate and successful live concert tours of the decade. Amidst all that, Bowie continued to collaborate with other artists on songs that had a profound effect on me. The world lost one of the greats when David Bowie passed away recently. At the dawn of the 1980s, David Bowie teamed up with Queen to record “Under Pressure” in 1981. It would shoot to number one in the United Kingdom, Bowie’s third song to do so. It was an unforgettable song, as the voices of Bowie and Queen’s lead singer Freddie Mercury meshed together nicely. It was also a sign of things to come when it came to duets. 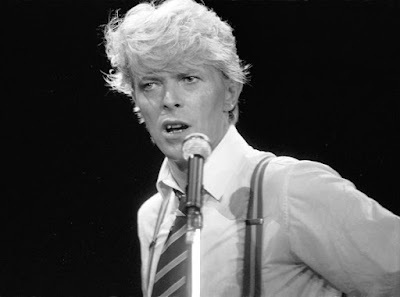 One odd memory I have of Bowie happened when I was in Grade 9, so late 1983. There was a battle being waged in Lethbridge between two radio stations that wanted to be considered the top rock station: 1090 CHEC, an AM station, and LA-107 FM. There was also a TV commercial, which had a man sitting on a bus bench. A rollerskater skated by wearing headphones blasting “I Don’t Wanna Dance” by Eddie Grant. Then the guy saw LA-107 stencilled on the bench and changed stations to, “Let’s Dance” by David Bowie. It’s funny – both those stations eventually stopped playing that kind of music, either by changing format or folding completely. Anyway, Bowie released another album in 1984 that produced another hit single, “Blue Jean”. The video featured Bowie in full face makeup. I recall seeing that on one of the video shows of the time, “Video Hits” after school on CBC I believe. He eventually won a Grammy for that video. However, the most memorable songs for me that David Bowie recorded were ones he did with other artists. Although it did not occur in the 1980s, the first time I heard his most memorable duet was at the end of an episode of “Entertainment Tonight”. Quite honestly, I had no expectations of him, given all my experience of David Bowie was him being out there. That had recently been cemented when one of my buddies told me Bowie had named his daughter Zowie Bowie. Wow. So, when Mary Hart signed off “Entertainment Tonight” one day in mid-December, I was not expecting much when she introduced Bowie singing “Little Drummer Boy” with Bing Crosby. I recall my initial reaction was how could they even go together. That song, “Peace on Earth/Little Drummer Boy” was actually part of Crosby’s final Christmas special on CBS. Five years later, on Christmas Day of 1982, it hit number three on the UK charts. Bowie’s voice in that song absolutely melted my heart. It was awesome. In 1984, I started listening to music and by 1985 had received my first ghetto blaster for Christmas. I used to listen to LA-107 a lot, partly because I bought into the hype it was better than CHEC. I started listening to various segments they had, and soon heard this haunting song from a movie starring Timothy Hutton and Sean Penn. The movie was called “The Falcon and the Snowman” and its soundtrack produced a song called “This is Not America”. Initially, the song was recorded by the jazzy Pat Metheney Group, but producers wanted more. Consequently, Bowie was brought on board to provide the vocals. The song is about disaffected youth who get involved in drugs and espionage. Bowie’s haunting vocals and the music by the Pat Metheney Group fit those themes very well. “This is Not America” hit the top 40 in both the U.S., peaking at number 32, and the U.K., peaking at number 14. Again, Bowie’s vocals touched me deeply. Then, to round out that year, came a collaboration of mythic proportions. My hero Bob Geldof had already begun to raise global consciousness about the drought and famine in Ethiopia, with Band Aid, a gathering of musicians who raised money through the release of their Christmas song, “Do They Know It’s Christmas?” at the end of 1984. Geldof was following that up with a pair of all-star concerts in London, England and Philadelphia he called “Live Aid”. There were dozens and dozens of acts set to play. When the concert was set to broadcast live on American TV, there was a very special segment that had been taped earlier. It was David Bowie and Mick Jagger singing their own version of “Dancing In the Street”. They sang and danced, and set the tone for an incredible broadcast. Bob Geldof is one of my heroes, fuelled in part by what he did with Band Aid and Live Aid. “Dancing In the Street” is a part of that. It hit number one in the United Kingdom and number seven in the United States. All proceeds went to the famine relief efforts. So, by then, David Bowie had cemented a reputation that he played well with others. All these great collaborations are just another part of his mystique. The 1980s had a lot of mega-tours of musicians. They would descend on a venue and stage an elaborate show for two hours or more to promote the artist and whatever album they were selling. One of the biggest tours of the 1980s was the “Glass Spider Tour” in 1987, which even made a stop at Commonwealth Stadium in Edmonton. It was all the talk at one point, especially how Bowie was lowered onto the stage in a massive glass spider. My best friend Chris Vining told me he had heard mixed reviews of the tour. The Georgia Satellites, one of his favourite bands at that moment, warmed up the crowd, which was continued by Duran Duran. Bowie, however, could not sustain that momentum. Interesting, I thought. If the concert was all about the show and less about the music, that sounded good. Often it seemed to me, Bowie was as much or more about the show than the music anyway. There was never any danger he would not give the crowd a show. By that point, he did not really have a strong single out there, so that’s all he could give them – beyond all the favourites he had already recorded. The other cool thing I recall about that tour was another musician I liked, Peter Frampton, was playing with Bowie. I was just getting into his album, “”Frampton Comes Alive”, which my brother recorded for me. That would have been worth the price of admission itself. Fans flocked to the 86-show tour. It grossed $86 million, making it the fourth highest tour in the decade. The first time I saw David Bowie in a movie poster was for “Merry Christmas, Mr. Lawrence” (1983), in an issue of “Tribute” magazine. He played a prisoner of war in a Japanese camp. The next time I saw him was playing Jareth, the king of the goblins in “Labyrinth” in 1986. That was a movie created by Jim Henson, the master puppeteer behind Sesame Street and The Muppets. Two years later, in 1988, he played Pontius Pilate in “The Last Temptation of Christ”. David Bowie just continued to expand his horizons, adding acting to his ever growing body of work. Never could I say I was a fan of David Bowie. I never owned any of his albums or actively sought out his music in any way. Yet, I have always been impressed with his desire to innovate and create and branch out. He never seemed to want to settle for anything, and I respect that. However, there is one part of David Bowie that does sit with me. Whenever I hear his name, I am instantly reminded of him and Mick Jagger dancing, singing, and raising money for a good cause. And I am reminded of an incredibly touching Christmas song that truly touched my soul. They are two duets that had a profound effect on me in different ways. For that, I am eternally grateful, and quite sad that David Bowie will no longer be around to share more of himself.